Explore what’s possible and encourage those with a quieter voice to contribute with the 3×3 Technique. This resource helps to generate conversation and new ideas, it encourages participation and it can help a young person feel more involved. The Me first team read about this activity in a blog written by Simon Tomes from the IT startup, Qeek. It can be used in all sorts of settings and it can be used in group formats and in 1:1 sessions. At Me first we’ve found it helpful to facilitate communication with young people in health and social care. 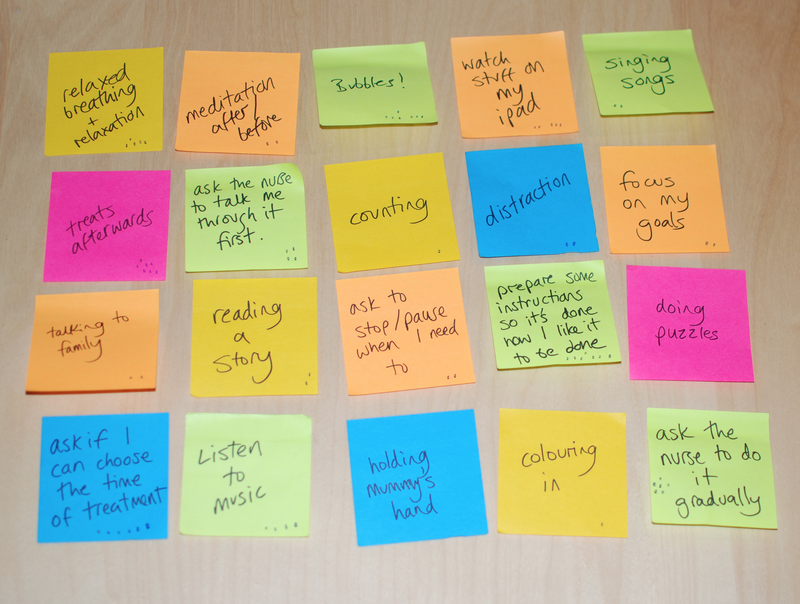 Each person comes up with 1-3 ideas about a chosen topic and writes down each idea on separate post it notes. When this is done, each individual pitches their ideas to everyone else with 15 seconds for each idea. Afterwards, all post it notes are gathered up for everyone to see and then each person draws a dot on the idea that inspires them the most. Any unselected ideas are put to one side. This process is repeated two more times so that each individual comes up with at least 3 ideas. At the end, everyone votes again from all the ideas accumulated but this time they have three choices. They can choose their favourite by placing three dots next to it; their second favourite gets two dots and their third favourite gets one dot. You can then rank the ideas by how many dots they have on them. You can choose to ignore or include the previously discarded ideas in this section. As with many Me first resources, the 3×3 technique can be adapted for different participants . For example you can remove the pitching or you can choose to only rank ideas at the end if there are limited numbers included. It’s great if all present can contribute to ideas. In our experience people come up with more ideas than they initially think possible. However, a young person can participate just by choosing/ranking the ideas if required. It can also be adapted by using alternatives to drawing dots to mark ideas such.